For a large (227K) view of the above picture click here. With this page taking a look at a summer weekend of workings in the Leeds area, what better choice (apart from the 'Cornishman') to feature 'The Devonian' service. It is seen here leaving Leeds behind D26 on November 4th 1961 (I know, hardly a summer day, and not quite the era featured in the notes below), but it is a Peak/Class 45 with some fine looking Mark 1 stock, complete with the wooden nameboards on the coaches. I well remember many a happy hour spent on Derby Station on summer Saturdays watching for the long parade of NE/SW services as they headed to the Cornish Riviera with coach loads full of passengers off for a week or two in the sun, whilst the equally heavily loaded northbound services were bringing home wearied holidaymakers. In those days the station announcer still identified the Cornishman & Devonian in the announcements, but the wooden carriage nameboards had been replaced by the throwaway paper labels pasted on the coach windows. On the first page of these Holbeck area memories the pitbook was used to feature workings on a weekday, to compliment this the pitbook pages will be used to show the workings on a weekend summer Saturday & Sunday - the weekend of Saturday/Sunday September 5/6th 1981 has been selected. A slightly toasted 31404 at Holbeck on April 21st 1992. 25265 soaks up the morning sun at Holbeck sometime during 1980. 25265 would be one of the Class 25's to remain in service until the very end, its last duties being in the Holyhead area. And of course it would eventually reach preservation. Four views taken across a span of maybe 35 years, possibly a little more, looking from the south side of the Nineveh Road bridge. The first view shows a Class 25/0 and ballast train, date unknown, though the Class 25/0 still has its original exhaust port location, so its probably about 1968/69. The second view, from July 3rd 1985 features Railfreight liveried 31110 and blue liveried 31165 approaching Holbeck. The third view features 50008 on railtour duty in the Leeds area on August 30th 1993. The last view is taken during 2006. Much has changed in the view but the bridge in the background remains a constant. Photographs courtesy E Wood (left), Peter Ryan (left center) and M Kaye (center right & right). This weekend would be towards the end of the holiday season with perhaps another two Saturdays left to run with the summer timetable. D57 22.15 45140 (1D57) 21.50 Bradford Exchange - Leeds - ? The information below provides more detail about the workings listed above. The information provided is in two parts, the first part records what the diagram was supposed to cover, whilst the second part (actual working) details notes from Michael's notebooks of what actually happened when he ended up on these jobs, including times, dates, locomotives and other happenings! For this job it was a case of signing on at Holbeck at about 19.00 Saturday night, walking up to Leeds City station, then travelling passenger to Manchester Victoria, frequently on a Class 123 Trans Pennine unit. From Manchester Victoria it was another passenger trip to Dean Lane station which is situated next to Newton Heath shed. Here the locomotive was picked up and taken down to either Cheetham Hill sidings or Redbank sidings, collect the newspaper vans and take them down to Manchester Victoria, always on the very lengthy platform 11. Here the twenty odd vans would be split to make two trains. A runround would be made, now with the locomotive at the Leeds end of the train, waiting here until the newspapers were loaded, a perk of the job here was to receive one of the newspapers! The trip back across the Pennines included stops at Huddersfield and Dewsbury. 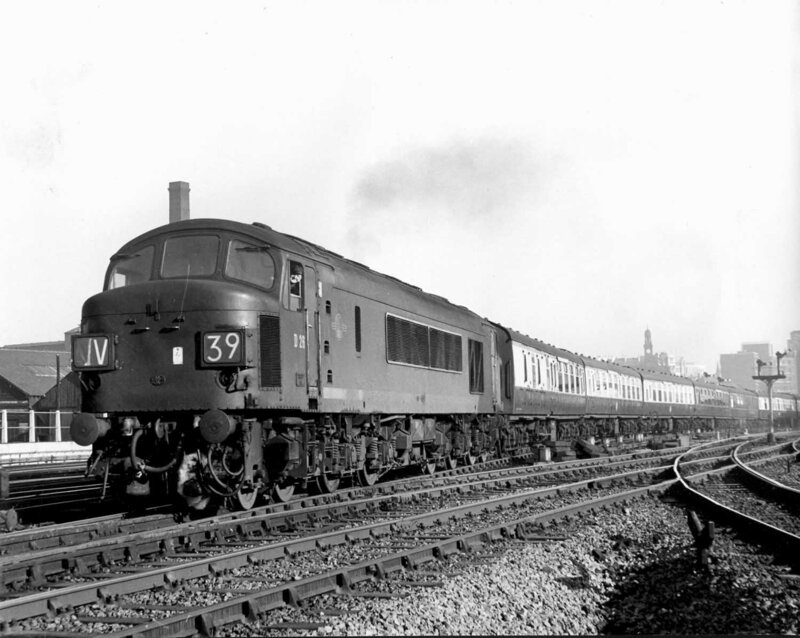 At Leeds the vans would be left at the PCD whilst the locomotive and crew went back to Holbeck. Arthur lived in Beeston and walked or rode the bus to get to work, occasionally he would get a ride by car from one of the staff. One day after doing one of the newspaper turns the secondman offered Arthur a lift home. Now Arthur was not a small man, maybe six foot fourteen inches, weighing in at twenty stone with hands like shovels. With the job done Arthur squeezes into the secondman's car, he doesn't even take his hat off despite the confines of the small car! The sunroof is open to provide a little more headroom. They pull up at Arthur's home at about 4am and and he slides down in the front seat to assist in getting his body out of the car. Using the dashboard to gain leverage to exit the car all is well until the dashboard suffers serious structural failure, slowing Arthur's exit and leaving the poor secondman with a car needing a little repair work! This was a straightforward working, but it appears the train went forward from Leeds with a different locomotive, since we took 45140 back to Holbeck in this instance. 45120 has the road as the driver opens up the throttle to move this service on towards York, date unknown. It was a lovely summer's afternoon as we made our way over the line from Accrington to Rose Grove. At Hampton station two Traction Inspectors were lineside with a radar gun monitoring the speed of passing trains. However all was not well as we passed by them for they were not alone, some police officers and what appeared to be some members of Her Majesty's Forces were also present. Apparently in an idle moment between trains the radar gun had been used to track the speed of a nearby helicopter. The Inspectors were seemingly unaware of of the ownership of the helicopter, which belonging to the military was equipped with a variety of detection equipment that had been triggered by the radar gun. Once the source had been located by the pilot and relayed back to wherever, ground forces were summonsed to further investigate, no doubt with rather embarrassing results! On a now forgotten day during 1975 Driver G and myself were in charge of a special working to Blackpool with a Class 40 as the locomotive for the day. Once Blackpool had been reached and the passengers had detrained, the locomotive and stock were propelled out of the station to the carriage sidings. Here the locomotive was detached and we travelled down to what passed as the shed, which included a couple of sidings next to the station. On one side was a wall which led onto a row of terraced houses. Driver G, due to his size did not move to fast, so I was first to drop down off the locomotive, only to be greeted by a voice saying 'Hope you are not leaving that thing running? ', the question coming from a small guy with a handkerchief on his head, string vest and baggy trousers, he further stated 'the smoke from that thing is coming down here (indicating the houses)', which was a fair comment for the sixteen cylindered Class 40. On that comment I shouted up to Driver G 'There's a man down here wants to speak to you'. Now Driver G was somewhere in the region of twenty two stone and as he ventured from the cab down the steps to terra firma the local resident disappeared without trace. No matter, the locomotive was shut down, we went home on the cushions leaving Blackpool and its warm sunny afternoon to the day trippers and local seagulls. Holbeck, sometime in 1976 with a variety of locomotives on view - making sure that 55015 doesn't go anywhere is Michael, not long into his career on the railways. I can remember one night at Holbeck (it was a very busy night) the driver asking me 'have you got a key kid', when the driver asked you this, you got stuck in and helped move the locomotives out of the fuel shed ('pit') and into the roads for their next jobs. Anyway this night after the driver had asked me, I replied to him yep, 'Right kid move that Deltic into No 6 road', climbing into the cab of this fantastic machine I began to move it out of the fuel shed and down below Nineveh Road bridge, it was necessary to change ends and pull the points ready to move the locomotive into 6 Road. On setting off with the Deltic, I heard a beep beep beep beep followed by the brakes coming on, not knowing what all this was! After waiting a minute, the brakes came back, so I moved it again, again after a minute, beep beep beep beep, still not knowing what this meant, the brakes went on again, a move which should have taken five minutes to put a locomotive from the fuel shed into a road, took aboout 15 minutes. After disposing of the Deltic I walked back to the fuel shed for the driver to give me my next job, when arriving at the fuel shed, the driver with a fitter asked me 'what was wrong with the locomotive' my reply, this thing kept beeping in the cab, the driver and fitter after a laugh told me it was a 'new' device called the vigilance device and you must take your foot off the 'deadmans pedal' and reset it again. So that was another thing I learnt! It was to be a few weeks after that when I came across that device again. The first Deltic I drove on the mainline was 55004 from Leeds with coaching stock to Neville Hill and then 0L50 light engine back to Holbeck sometime in late 1975 early 1976. The first Deltic to be driven on the mainline by Michael was 55004 - in this undated view at Doncaster Works it appears the the working days for 55004 are now over. Whilst on Deltic driver training we were scheduled to work a turn from Newcastle to Berwick. On drawing away from Newcastle station, with a moment of silence in the cab one of the Deltic trainees commented 'what a place to build a castle right in the corner of the junction, why couldn't they put it further up!' On the same trip we were accompanied by a Healey Mills man who had never been in a Deltic. Because Healey Mills men never get past 60mph I kept asking him if he was OK with the speeds the Deltic was capable of. The Traction Inspector had gone off into the back cab to catch some sleep, whilst we were all shooting the breeze up front. This ended rather abruptly when the Traction Inspector returned to the front cab, commenting that his slumbers had been disturbed by his falling off the cab seat, and noticing that the speedometer was coming back down from 115mph! Then followed the polite warnings and no more was said. A fine view of 55016 as it carries out yet another duty on the ECML, date, location & photographer unknown. During the 1970's when several of us had regular turns on the Deltics one of the lads brought his 35mm camera along to capture some views whilst on the turns going up to London. These views included views of the driver taken from the nose through the open access door. Suffice to say the driver on this turn was not amused by these antics giving the camerman a good dressing down with some delightfully colourful language! Later events would find the driver confined to the nose for a short period of time. The presence of a toilet in the nose meant caution was necessary when doing anything whilst another train was passing. 55007 gets to grips with a northbound express at York on June 10th 1978. During the hot summer days of 1976 I was on the ECML working as a secondman on the services up to Kings Cross. Prior to departure from Kings Cross one hot day I had the cab window of 55009 open looking across the platforms at the waiting passengers. On getting the off Driver K advised that I shut the window as we would soon be away. I attempted to shut the window but only succeeded in having the window and its frame come off in my hands, closely followed by some suitable language from Driver K, and best not repeated here. Valiant attempts from Kings Cross to Stevenage to return the window and frame to its proper location failed, so I was left with the grim option of sitting upright and as close to the open space as possible to reduce the draft from reaching a none too amused Driver K. And at the speed attained by the Class 55 pretty much every piece of cigarette ash, dust and other loose items in the cab and been well circulated around the cab! A glorious August 29th 1977 finds 55017 heading an 'Up' service through Doncaster. It was on another day during 1976 that we were in charge of a northbound service on the approaches to Peterborough. We had been running at 100mph through Yaxley with the driver taking the power off for the 90mph restriction through Peterborough station. Sitting on the edge of my seat with the driver reapplying power, we had just about reached full power when there was an almighty surge (you could feel the drawbar pull out and then you felt as if you had coupled up to the train). I fell off the secondman's seat hitting my chin on the windscreen wiper cylinder. On regaining my feet the immediate inquiry to the driver was whether we were still on the road? The driver apparently not to perturbed by the whole situation advised there had been a flashover of some sort, and all the fault lights were lit up like a Christmas Tree. I disappeared into the engine room to see if there was any damage, which was not an easy task as both the cab and the engine room were now full of dust and what ever else had been shook loose. No damage was visible although both engines were now silent, the driver deciding to coast for a few minutes, to allow everything to settle down. With the reverser handle moved to the engine only position an attempt was made to start the first engine, it burst into life, shortly followed by the second engine, and so we were off again, but what an experience. On another Deltic a good friend was in the secondman's position when one of the engines shut down. The driver asked him to take a look and whilst in the engine room the driver applied power to the working engine, which promptly threw a piston with engine components hurtling through the engine room. The second man was out of the room like a shot, visibly shook up and to this day affected by this incident. With Holbeck West Jct already passed and Whitehall Junction approaching, the journey from Kings Cross for 55010 and its train is almost over, sometime during 1980. The following records typical workings involving Holbeck crews and the Deltics, for some of the diagrams the Deltic portions were very small. They may have appeared somwehat mundane and normal all those years ago but now the electrification of these lines and the predominance of multiple units has certainly changed everything. Same diagram as above with locomotives 55011 and 31419 - load four coaches 127 tons. Same diagram as above with locomotives 55017 and 31410 - load four coaches 127 tons. Book on at Holbeck 01.00 (relief) - take 55014 from Holbeck to Leeds City, arrive 01.40. Book on 08.22 for diagram 122 which involves alot of light engine movements between Holbeck & Leeds City and therefore a lot of walking!! then 0L50 taking 47422 from Leeds City to Holbeck for fuel & water, arriving Holbeck 11.03.
then 0A21 taking 47422 back to Leeds City arriving 12.22. Similar to the above diagram with locomotives 47526, 47430 & 55018, except 55018 was failed at Holbeck so did not work the 0A28/1A28! Similar to the above diagram with locomotives 47427, 47543 & 55021 - the arrival of 55021 at Leeds City to work the 1A28 was seventeen minutes late & running on only one engine, no fuel in the No.1 engine. Similar to the above diagram with locomotives 47521, 55011 & 47517. Book on at Leeds at 12.13 for diagram 159. Depart Kings Cross 17.04 arrive Leeds 19.05 and book off there. This may have been the day I had serious trouble with the cab window on 55009, see related story above. Book on at Leeds at 05.55 for diagram 156. Locomotive 55012 on 1A04 eight coaches 264 tons. Depart Bradford Exchange as 1A04 07.20, arrive Kings Cross 10.15 - at this time the curve at Wortley Junction was still in place so no run round was necessary at Leeds. Depart Kings Cross 11.25, arrive Leeds 13.55 - after arrival at Kings Cross 55012 had followed its train out of the station and waited in the tunnel before dropping down onto another recently arrived service. Similar to the above diagram except the A04 was worked by 47520 and the 1L13 by 55004. Similar to the above except the A04 was worked by 55021 and the 1L13 by 47043 - the Class 47 lost three minutes due to it being a Deltic diagram. As above except the A04 was in charge of 55003 and the 1L13 had 55009. Depart Kings Cross 18.05, arrive Leeds 21.01 after a four minute late departure from Kings Cross. As above diagram with 1E07 behind 55004 and 1L34 behind 55011. The southbound working was delayed 29 minutes due to a total points/signal failure leading to additional stops at Peterborough & Huntingdon. This affected the northbound working with a five minute late departure from Kings Cross due to the earlier delays. The backlog of traffic at Kings Cross and an extra station stop at Huntingdon put us about twenty minutes late into Leeds. Depart Leeds City 07.55 arrive Kings Cross 10.40 - the locomotive scheduled for this working, 55002 had failed at Leeds, twenty five minutes delay had been incurred by bringing up 55012 from Holbeck and a further fifteen minutes were lost due to permanent way work en-route. Return home to Leeds as passenger on 14.05 ex Doncaster. The unmistakeable outline of a Deltic, this time 55012 graces the No. 6 road at Holbeck depot, parked behind it and barely visible is a fine looking class 25! 1A12 depart Harrogate 09.04 arrive Leeds ?? The 1L02 was cancelled this day due to the train running 200 minutes late caused by heavy snowfall. This was my last run with a Deltic over this route as most of the diagrams to Kings Cross would soon be converted to High Speed Trains (HST's). It was not the end for the Deltics at Holbeck as from time to time they would travel over the Trans Pennine route. The arrival of the HST's led to the Holbeck secondmen doing other trips, becoming spare a lot of the time through late 1980 and into early 1981. In April 1981 I began training to become a passed driver, this being obtained in October 1981. I was registered as a Driver in April 1986 just after Holbeck closed. 55008 lays over at Holbeck sometime during 1980. I remember one instance of going to Holbeck to pick up my wage packet (weekly in cash). It was 11am and I was under strict orders from the wife to be back in one hour so that we could go shopping. On arrival at Holbeck a couple of the lads were there (well seven of them), they were going to the club and inquired if I would be joining them. My answer was of course No!, but after several more attempts at asking the same question the No! became an OK then! I picked up the wage packet, travelled up to the club on my motorbike and after a few pints decided to call it a day as the clock approached 8pm. The trip home was made by train to Wakefield Kirkgate, then a twenty minute walk to the house. Arriving home at 9pm I went in through the back door where the good wife with her usual accuracy pronounced 'Your drunk'. Right of course! Although train heating boilers are now a thing of the past, when I first signed on at Holbeck they were an everyday happening with their reliability being a little hit or miss. On one particular locomotive, a Class 46 I think, the Stone Vapour boilers did not stand upright but rather were laid horizontally and were equipped with a sight glass near the floor. The sight glass would be used to check if ignition had occurred. On this particular boiler I could not get the boiler to spark, so inquired of the driver what the problem might be. He pointed me to a small orange box about nine inches square mounted on the floor which provided electrical current for the boiler. I was advised to kick the box and this should fire the boiler up, perhaps a slightly foolish thing to do as the boiler had by this time received quite a quantity of fuel. On giving the electrical box a good tap the expected happened - the boiler fired up, but as it was way overprimed a great length of flame shot out from the point where the missing sightglass should have been. My return to the cab led to the driver commenting that I looked like a miner & was the boiler now working, followed by the suggestion to go get a wash before I did anything else! Holbeck crews frequently handled a train of new cars, picking up the working at Doncaster, then running via Hare Park - Calder Bridge - Wakefield Kirkgate and through to the up platform at Wakefield Westgate, to allow us to back the train down into the delivery sidings. Here we would go off to breakfast in the dairy place kitchen, having our meal alongside the dairy workers. Once breakfast was done with it was back to the car carriers to assist with the unloading of the cars. Its where I learned to drive, though some of the manouevres would be an immediate fail for the driving test! One time I remember a car getting dinged, but nothing was said. 40097 with a train of empty Cartics waits to leave Wakefield Westgate yard, date unknown. A Class 40 on this job was a bit unusual, a Class 31 or 47 was more likely. Above the 4th wagon is Wakefield Unity Hall (disused as at 2011). At the end of the train is the dairy building, this is where the crews went after unloading or whilst the train was being unloaded to go have our breakfast. On the extreme left above the first/second Transit van is a wall, which marked the site of the original Great Central Steam Locomotive Depot. The track in the foreground is now a short siding, and just out of sight is Wakefield Westgate Station to the right. When the train had finished unloading all the cars, it would then be reloaded with cars that had been damaged whilst unloading, then would come onto the main line and go into Wrenthorpe Sidings, about one mile up the track, run round its train and then depart. It was very unusual to send the train via Leeds and Normanton and back to Turners Lane, this being at that time of heavy traffic near Leeds. Where the train stands is now a multi-story car park! Another view of the car train, this time from about 1980 with a Class 31 putting the train back together prior to leaving the yard. The shunter is Tony Osbourne. When I became a Driver I remember actually handling this job. On one occasion the train was facing the wrong way round (which would have meant reversing all the cars off the wagons), so upon reaching the triangle at Calder Bridge Junction we uncoupled the train, ran round it with the locomotive and pushed the train towards Turner's Lane. This move suddenly became more challenging as a bank of fog rolled in off the river. I could no longer see the guard so we reverted to the time honoured method of blowing the whistle (two for forward, three for back, four come back steady and so on), happy days - the dairy is now gone and the cars don't run anymore. Calder Bridge, May 7th 1985, looking northwards along the route that the car train would take. Up ahead it will make a left turn towards Wakefield Kirkgate - sometimes the car train would be turned at this triangle. The line to the right leads to Normanton. The wagons to the right mark the site of Belle Vue locomotive depot. The locomotive off the car job would be forwarded to one of several locations, either Holbeck (via Normanton), Healey Mills or Doncaster. Every once in a while it would go back to Tinsley, not the most popular choice. At Tinsley a big sixty seater coach was provided to take us and any other train crew to Sheffield Midland, it seemed a bit of overkill when most times saw only about half a dozen crew making the trip. From Sheffield Midland it was passenger back to Leeds. The following views of locomotive cabs/driving desks, were mostly captured on film by Michael. Perhaps the worst cab of all was that of the Class 08, it was a cold cab, trying to keep warm often meant turning on the hotplate. You were stood up all the time, though I did manage to sleep on one for five hours in a tunnel at New Pudsey one night, there wasn't a lot of room in the cab! But they were after all built as workhorses with few crew comforts. On one occasion we were coming back from Doncaster light engine with a Class 24. We were on the 'West Riding ECML' and we were talking about this type of locomotive, the driver was running at about 65mph and thought we should give the locomotive a run for its money. The line had been climbing through Fitzwilliam, at Nostell the grade changes and its downhill all the way to Wakefield apart from a small stretch of line at Sandal & Agbrigg. Well the driver managed to get the Class 24 up to 80mph, I'm pinned down on my seat and we're still going and going and going! Up head in the Wakefield area were 50mph & 35mph speed restrictions and these locomotives were not known for their braking abilities. Eventually its time to ease back and my driver 'put the lot in' and we were hanging on for dear life, the brake blocks were giving their all and smoking nicely, the rest of the locomotive giving the impression that the end was near. I don't recall at what speed we passed through the restrictions but the hard braking continued on the approach to Leeds. A short story about an evening thunderstorm at Holbeck. When climbing into a Class 25 you had to duck your head as the cab doors on these locomotives were a bit small. One evening I was sent over to number two side, No 3 road at Holbeck, to start up a Class 25. Rain was approaching, in the distance there had been several minutes of thunder & lightning, after a quick run across the yard my refuge awaited me with protection from the approaching storm. As I began my climb into the cab, the atmosphere went into void mode, a sudden silence, I stopped on the steps, then a big bolt of lightning followed by a rather loud clap of thunder, I launched myself into the cab to get out of the way of the storm, but my forehead connected rather firmly with the top of the door frame. After an hour sitting it out in the nice warm cab of the Class 25 I returned to the messroom, to be confronted by some strange looks. I had a right bump on my forehead, some of the drivers said I had a big head, so it served me right, no sympathy there then! I was sat with Ian Moorhouse in the cab the other day and of course we were telling railway stories, Ian was the youngest Driver at Holbeck before it closed. We talked about the early days when we started on the railway and when certain Drivers would let us drive the locomotives and trains. Ian recalls, �We went inside at Saville colliery, which was connected to BR at Methley Sidings signal box, they had a Class 25 and collected some wagons in Saville Colliery and were making their way to Healey Mills, at Saville Colliery the driver told Ian, �I�ll walk up to the signal and get on the phone to ring the signalman and tell him we are ready.� The signal was very unusual at that time, it was a small �summersault� type signal � anyway as the driver began his walk to the signal, Ian began to apply power, he noticed that the ammeter began to undulate, so Ian applied more power and the Type 2 was still revving up & down, Ian was moving to the signal nice and steady, by now the driver had finished on the phone � he turned around and put both arms in the air! Ian stopped, the driver walked up to the locomotive, which by now wasn�t very far away, Ian stuck his head out of the window and said to the driver �Don�t know what's wrong with the locomotive, but the amps keep going up & down�. His driver replied was �Yes of course they will � you are off the road! A Class 26 cab, an interesting contrast with the Class 24 cab above, how the BR designers fared differently over the private industry counterparts back in the late 1950's. According to Michael the Class 31 cabs were pretty good, just the rest of the locomotive was crap. About the fastest I ever went on a class 31 was 80 mph (the speedometer was calibrated to 100mph), they were good at stopping but couldn't pull the the skin off a rice pudding. A Class 31 story just recalled is that of the 'Bullion Train', which was used to deliver money, actually it was our wages coming to the shed. The timings of the train were not known by the staff until the day the train ran, the only clue was by our booking on time, but still we didn't know what the diagram was for obvious reasons. On this day in particular we were passenger to Doncaster, to pick up the 'Bullion Train' and then from Doncaster it went to Hare Park, Turners Lane, Normanton and Stourton. At certain locations the police watched the train pass by according to the timing sheet. At Stourton you were met by loads of armed police officers, with vans to transfer the money. So one day I get the diagram in the morning and travel passenger to Doncaster, now being a railway man you always looked at the bottom of the diagram first, to see what time you finished. We leave Doncaster and I'm off like a bullet and get into Stourton about twenty minutes early, where the police were waiting for the transfer of the money. Upon my return to Holbeck with the Class 31, I got a right dressing down from the foreman for not reading my diagram correctly, it was important to maintain the correct passing times, the police were turning up ten minutes after I had passed the locations! On another occasion when I was working the 'Bullion Train' I really had a great need to use the toilet. On these workings an armed police officer travelled with you in the cab, so on arrival at Stourton I was in dire need, but you can't leave the cab of the locomotive, and was reminded of this fact by the policeman. So I told him that I'd have to go in the engine room, which would normally not be a problem except that Class 31's were not fitted with toilets. Relief came by trying to wee through side louvers of the locomotive. The operation proved successful, no one was hit by the flow coming from the locomotive, the policemen on the ground thought it was just part of the locomotive's normal happenings. Class 37's and 40's were bad, the 37's being worst, at No.1 end you had the radiators and when the clutch came in at high water temperature it made a right racket, the Class 40's in the winter apart from going deaf, you froze, I think English Electric had something against the train crews. Whilst working the 11.10 Liverpool Lime Street - Newcastle (?) - date unknown - with 40075 in charge, we were approaching Huyton heading towards Manchester when the driver (smoking a pipe and wearing a flat cap) shouted across the cab to get down on the floor, I did so and was closely followed by my driver, thereby followed by a big bang with glass showering everywhere. The driver had spotted three idiots lowering a small cooker or fridge over a bridge parapet. Whatever it was hit the center window of the Class 40. Luckily it rebounded up over the cab roof and along the locomotive roof before falling onto the track. After checking the locomotive & train and reporting the incident it was back to getting the passengers on their way. Michael remembers many a cold night in the cabs of a variety of Class 40's being used for ballast workings, and very grateful for the heavy overcoats provided. Although the cab heaters were up to the job the cab glazing and doors were not good at holding back the draughts. There were a couple of drivers at Holbeck who were on the short side - Dennis Ward (Concrete Gnome, we called him), George Brown & Terry Foster. Their shortness was of no concern unless they were stopped at signal D310 on the approach to Doncaster. Normally if stopped the drivers would step down and get on the phone to the signalman when stood at a signal, but a couple of Holbeck drivers commented that when stood at the D310 signal they would send their secondman to get on the phone. Because, if the driver had got off the Class 40 they couldn't reach the handrails to get them back onto the first step! Class 45: 45106 near the end of its working life. Michael remembers that the Class 45's were fitted with very good cookers, in particular for cooking onions in tin foil. One day we relieved a crew from a Class 45, unfortunately this crew had left the cooker on with the lid up so when yours truly turns up the tupperware lunch box is placed on the cooker lid, which is already warm, but I don't notice this. After about twenty minutes my mate looks over and asks 'Can you smell something burning?' So we start looking round the cab, checking the heaters, then into the engine room and then outside to have a look around. Eventually the cooker drew our attention, but it was too late, my lunchbox looked like the Titanic going down. The remains of the plastic box were pulled off the cooker lid, it smelt horrible. My driver said 'Don't worry Dan, you can share my sandwiches, whilst I split the undamaged onion with him, Happy Days! Of the locomotives used by Michael the Class 45/46's were perhaps the best for heating in the cabs, whilst the Class 47's were perhaps the best taking into account all the other aspects of cab comfort. On the class 45's/46's the toilet facilities were quite cramped, the toilet was right up by the side of the boiler, so if the boiler was in use and the train was in motion, great care was needed in using the facilities. On another occasion Derek Welsh & I had just returned from a Sheffield via Cudworth job with a Class 45, the service terminating at Leeds. On arrival the guard got everybody off as quick as possible, so we could depart early and maybe get an early finish. At Neville Hill it was our job to stable the coaches, the second man to uncouple the locomotive from the train, then of course �light locomotive� to Holbeck as 0L50. On our way up to Neville Hill I was getting ready with my smock and hooking on/off gloves, then turning the boiler off, by the time this was done we were arriving on the reception roads at Neville Hill. As I jumped down Derek was pressing the �anti-slip� button device located on the end of the power handle of the Class 45, with his head out of the window shouting come on Dan! At this time we were still running about 30 minutes early and whilst on the ground in between the locomotive and the coaches, with Derek easing the locomotive onto the train, in order to get the coupling off easily, I could hear the short �hissing� noises coming from the brake cylinders, Derek was still messing about with the anti-slip button. On arrival into the cab, (ready to depart) Derek looked at me and said, �I've broke it Dan�, the anti-slip button was now well & truly stuck in, trying our best to get the thing out. The hoped for 30 minute early finish disappeared and soon became 10 minutes late, eventually the fitters came, and after another 10 minutes we were finally on our way, finishing up 35 minutes late, never mind it went down as overtime! So the motto is � don�t mess about with something that was working fine in the first place! 47417 July 7th 1988. After the confines of the earlier Type 4's (the Peaks and EE Type 4's) the cabs of the Class 47's must have seemed quite palatial, with the two large front windows and the wider desk area. Whilst Michael was doing his training as a secondman the traction inspector sent Michael and another trainee out with a Holbeck crew on a Class 47 to Birmingham. The trainee, somewhat enthusiastic about the whole thing decides to investigate the Class 47 and opens the panel in the cab roof (held by two catches). As the flap drops down the cab is immediately filled with an untold number of flies, both living and dead, half a sparrow, many feathers and other insect parts. A great majority of this ended up covering the driver, who unleashed some very vivid language on the two trainees and sent them to the corner of the cab for the rest of the trip! And on a nightime departure from Kings Cross to Leeds, again with a Class 47, there was a tremendous bang to the front of the locomotive. Without hesitating Michael stepped down to open the panel located behind the headcode indicators. Opening the panel released the remains of a large pheasent into the cab, now in the proverbial million pieces. The none-too-happy driver removed his pipe and gave some blistering verbal abuse to the secondman, sending him to the other cab as some sort of punishment. With the horns mounted in the cab roof their effectiveness was challenged should the grilles become choked with snow, frequently sounding as if the batteries were running down, or giving out muffled or distorted tones. 47633 MC Metals - the end of the road. This cab seems to have escaped the use of vast quantities of tape around the driver's desk (as compared with 47417 above), which still seems mostly intact despite its withdrawn status. The most noisy cabs were of course the Deltics, whilst the cab was sound proofed (well that's what was claimed) you had a large leather curtain to draw across the cab between the Driver and Secondman, when entering the cab you had a large sliding door and to the right of that (or on the other side left) were the two engine room doors. The cab of 56120 at Holbeck on March 17th 1985, possibly one of the earliest visits of the Class to Holbeck. The locomotive would eventually be taken light engine to Healey MIlls, a crew had to come from there to pick up the locomotive. The parking brake buttons are on the right, just above the switch panel, you never forget it - see story below. The Class 56's were not frequent visitors to Holbeck and since Holbeck crews were not trained on them, if they got stuck on shed there was a small problem. One time we were on the 'pit' (Fueling Shed) when a Class 56 arrived, the fitters eventually found out where the fuel and water went, but then nobody would move it...for it to be put into a road for the Healey Mills men to come and pick it up later....so it was stood there and was beginning to clog the shed up....so yours truly decided to move it. After a couple of minutes I had it running, it doesn't take much to find where the key goes and where the start button is, but then I turned around to the bulkhead to grab the handbrake and turn it, Ha! no handbrake! As for the HST's, well going to London in one, it's like being in a washing machine drum. With a HST you just thrash the engine continuously and the noise in the cab is about as loud has a Deltic. The HST's did not have toilets fitted, officially if the need came one was supposed to stop and take care of things, but when it was a case of getting home other temporary measures were used. On a Mark 4 set with a Class 91 the driving trailer allowed access to the train should a bathroom break be needed. The Eurostars also had no toilet but you could nip through the engine room and along a narrow connection between the power cars. If the locomotive was doubled manned one of use could make this journey back to get some tea. And the 142's, just to go off the subject of comfortable rides, of all the 'single axle units' 141's - 144's, the 141's had the best cab for being comfortable, (that was after they re-did the units). However for the passengers it was a joke, some stories can be told about the 141's. The 142's, whilst driving these your legs had to be permanetly stretched out under the driving desk, again for the passengers, nothing was really thought of them. 143/144's these cabs were half decent but you had a massive heater in the cab, so you were either boiling hot or freezing to death, you were always switching the heater on or off, again nothing was thought of for the passengers, my personal opinion, if they had taken a bit extra thought and put the 143/144 units on bogie's, you would have had a good unit...... Today, the 142's - 144's have all been refurbished for the passengers, with nice layouts and comfortable seats, why couldn't they do that in the first place! Its February 28th 2008 at Healey Mills - 57601 in the background has come to take withdrawn 37708 to Booth's, Rotherham for scrapping. To get to 37708 it was necessary to shunt 37695 out of the way, which itself looks like it is only fit for the scrapper. On hand to witness the move was our storyteller, Michael. The above view of the forlorn looking Class 37 recalls a story (from October 2009) of a visit to Booth's Rotherham. A good mate, John Ball owns two Class 37's and asked me to do him a favor - to go to Booths at Rotherham and pick up two compressors for the Class 37's. I have a trailer so there was no problem here! Well the big day came, Paul Corrie also came with us with the plan being to pick up the two compressors and then have a run down to Peak Rail at Darley Dale, Derbyshire. On arriving at Booth's, I ask John, 'How big are these compressors and how much do they weigh? ', he responded 'Oh approximately 250kg each'. After about fifteen minutes the fork lift came around the corner with the two compressors on a pallet, the fork lift driver was asked to put them onto the trailer one at a time. Whilst he was doing this I asked the driver 'How much do these weigh', reply, 'Together 640kg!'. As he was setting the first one down onto the trailer, the trailer axle went a funny shape so we hastily abandoned this idea, returning later with a van to bring the compressors home!